Support the Goran Scholarship Fund by making your gift now! ‌Lester Goran's role as teacher, mentor, and advisor has made an indelible impact on the lives of many alumni like you. 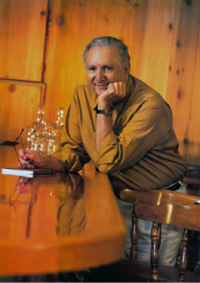 It's been over forty years since the first Creative Writing class was taught at UM, with Lester Goran at the podium, and those of us who know Professor Goran, know that the years have not diminished his energy, or his belief in the emerging writers who sit in his classes every semester. After teaching countless numbers of students, Professor Goran still models a love for the written word and the work ethic necessary to see those words in print. Your support to the Goran Scholarship in Creative Writing will make a difference in the life of a talented and deserving emerging poet or prose writer. 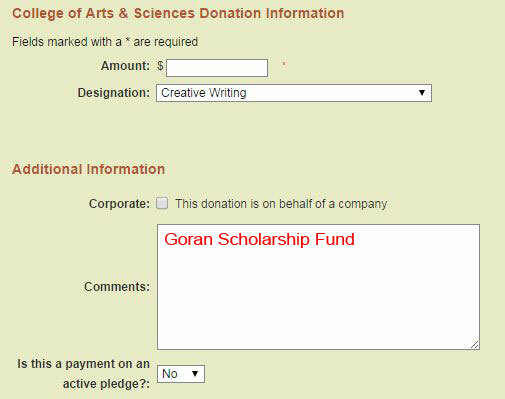 Please click the "Click to Donate" button below and designate your gift by typing “Goran Scholarship Fund” in the "Comments" section.